"A friendly, clear, authoritative voice"
"GM is a very demanding customer. Great job!" "Makes few mistakes ... an editor's dream"
"Truly committed to producing an excellent product"
"When my daughter stepped into the huge auditorium, she said, 'Mom, I can't do this.' But you made her feel much more comfortable and helped her get through it. You did a really exceptional job." "You are our rock. We know we can count on you to make our Bee a top notch professional event." "Your control was perfect, the tone remained light, and the mood was great. Super job!" "You were magnificent! People are still talking about the great job you did. You added an element of class." "Everyone I've talked with says they had goose bumps! It was a stellar presentation and really captured the reason we hold the program each year." Since 1979, Tom's recorded voice has been used in all 50 United States and in several countries, on more than 2,000 corporate videos and more than 10,000 radio and TV commercials. In his digital audio studio, Tom can record your project and e-mail an audio file to you quickly, usually in less than 4 hours! Video Narration. 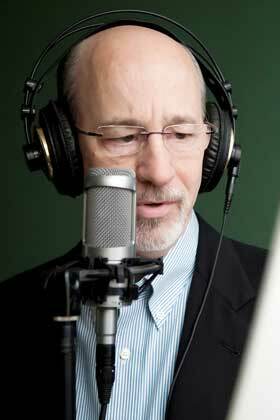 A professional narrator to make your corporate video sound friendly, clear, and authoritative. Click below for a 68-sec. sound bite. Commercials. A versatile voice-over artist who can take direction for your radio/TV spot and deliver a great product. Click below for a 42-sec. sound bite. Live Announcer/Emcee. An emcee or an announcer to give pizzazz to your live awards ceremony and help your award recipients feel special. Click below for a 15-sec. sound bite. To receive Tom's latest CD with his rates and a broader sampling of his recorded work, contact us via email or call toll-free 1-866-TW-SPEAK. United Airlines, Chrysler Corporation, DeBeers Diamonds, True Value Hardware Stores, General Motors, The Boeing Company, Allen-Bradley, Hamilton Sundstrand, International Jewelers Organization, National Mfg. Co., Newell Rubbermaid, Hayward Pool Products, Raynor Worldwide, Redken, Wahl Clipper Corporation, Newell Europe, Woods Equipment Company, and hundreds more.